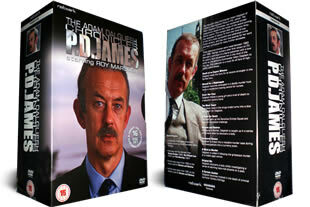 PD James' The Adam Dalgliesh Chronicles DVD box set. The complete collection on 16 dvd's. DELIVERED FREE IN THE UK. This detective/crime set is based on the novels written by P.D. James about detective and poet Adam Dalgliesh, who is based at New Scotland Yard but makes many sorties to other areas. This is the complete set and comes with many extras. 16 DVD Box Set delivered to your door. Very happy. Read the books first, and am now enjoying the films. Enjoyable though a bit dated. Ingenious plots though with plenty of twists and turns. If you liked the books written by PD James you will really enjoy these true-to-the-books dramatizations. All the stories are well cast and set and Marsden's portrayal of Dagliesh is superb. The pace is slow, as typical for productions of this age, but it is high quality drama. The set provides hours of entertainment.